Official news has been received by his mother that Private Doctor Pickup, Lancashire Fusiliers, has died of wounds in France. 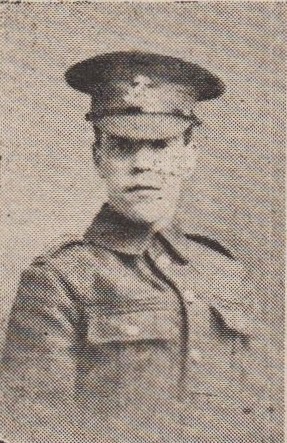 The deceased soldier enlisted in August, 1916, and went out to France early in February, 1917. He was wounded last October but returned to the front shortly afterwards. He was home on leave very recently and returned to France on March 22nd. From the official notice it appears that deceased was wounded in the head and left thigh from which he succumbed. He formerly resided with his mother at 135 Hudrake, Haslingden , and was highly respected in the district. He was 20 years of age and single. In civil life he was employed as a weaver at Commercial Mill, Haslingden. His name is one the roll of honour at Ebenezer Baptist Chapel, Haslingden. In loving memory of Private Doctor Pickup, who died of wounds in France, April 17th 1918. Of him I loved so well. My home is full of sorrow. "Remembrance sweet, sad to recall." From his sorrowing Mother, 136 Hudrake. Three little words - "Forget me not." And whisper a last farewell. May his reward be as great as his sacrifice." From his heart broken Mother and Will, 135 Hudrake. A good lad's worth cannot be told. From his sorrowing Grandma and Grandad, 541, Rakefoot, Crawshawbooth. We will leave him in God's keeping." As in the hour you passed away." Ever remembered by his Uncle Ernest (in France), Aunt Betsy Jane, and Cousins. Knoweth best what might have been. From his ever loving Pal Jim in France. For you, for me, for all." A token of respect from his sorrowing Cousin, Pte, J. Haworth (in France) and Annie, Pte J. Parkinson (in France), Pte. T. Dickinson (in France) and Pte. T. Caldwell. But angels, dear Doctor, will guide you with care." To old Blighty he'll never come back." But in our hearts he is with us still. We would give all we possess to have him back again." From his sorrowing Uncle Bob and cousins (Joo in France, and John in Germany), and Annie. Dear to our hearts is the place where he sleeps." "He gave his greatest gift - his life." From his loving Cousins, Ann Alice, Tom and baby Lizzie.